According to Statistics Finland, the value of new orders in manufacturing was 19.2 per cent higher in November 2016 than twelve months earlier. 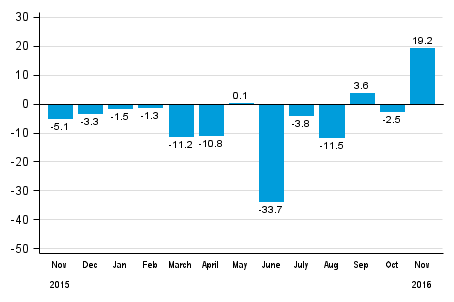 The value of orders has last been this high in August 2015. Strong growth came from the metal and chemical industries. During January to November, orders went down by 6.9 per cent from the year before. Enterprises received more orders than twelve months ago in November in the metal and chemical industries. In the metal industry, new orders increased by 25.8 per cent, and in the chemical industry by 21.2 per cent from one year ago. In the industry of the manufacture of paper and paper board products, orders declined by 0.9 per cent and in the textile industry by 2.2 per cent year-on-year. The index of new orders in manufacturing describes development in the value of new orders received by enterprises for commodities and services that are meant to be produced by establishments located in Finland. These statistics are based on non-probability sampling, in which the basic observation unit is an enterprise or a kind-of-activity unit. The sample comprises monthly 400 to 450 enterprises or their kind-of-activity units. 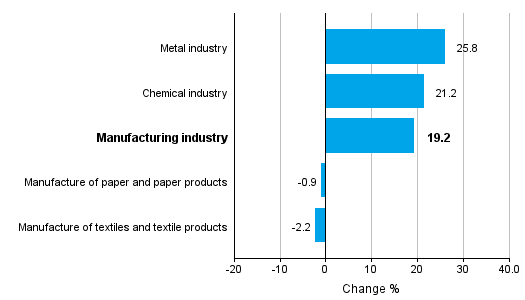 Index point figures and annual change percentages are published monthly for five industry categories. The time series start from January 2005 and their base year is 2010 (2010=100). The index figures may become slightly revised as new data accumulate and enterprises report changes to their data. Due to supplementations, the latest 12 months are revised in the releases. A detailed description of the statistics and the calculation method are included in the quality description on the home page of the statistics. ISSN=1798-6737. November 2016. Helsinki: Statistics Finland [referred: 23.4.2019].